“POWER TO TREAD..” Now available for purchase! This issue finds a desperate Lord Christopher seeking the assistance of…The Anointed 7, with Lord Richard on his tail. Legendary Marvel Comics artist Joe Rubinstein illustrates the cover, with colors by Greg Harms. Art and story by Brian C.I. Bradley. Highlight video from our HISTORIC time at last weekend’s C2E2 convention. New chapters begin, and new storylines are developed in this issue, as we see what Bridge, Sir Caliburn and Votary are up to in this 24 page full color anthology. 3 short stories illustrated Audrey Rosse, David McConnehey, and Mukah Ispahani. Written by Brian Bradley and Roberto Maisonave. With cover by Marc Moran. This one is special! This is for the Kickstarter backers. They (or their character creation) get to hang out with Quiver and help take down some bad guys. 24 pages full color. Story by David McConnehey, art by Daniel Khairullah. David also does the honors of illustrating the cover. THE ANOINTED 7 #28 NOW AVAILABLE! This issue revolves around a few of our KickStarter pledgers. As apart of their reward, we are featuring their likeness in a very special story. 4 strangers united with one purpose; to find a place of rest in a post apocalyptic world. Will they make it? Art and story by Brian Bradley. Cover by Roel Palmaira. 24 pages full color. Kingdom Comics Presents #8 is now available. This 24 page, 4 story anthology wraps up the storyline concerning THE 6! With artwork by Eddie Medina, Roel Palmaira, Rob Marsh, and Audrey Rosse. With cover by Jardel Cruz. This issue concludes the "Cats of Thunder" storyline. Art by Daniel Khairullah Written by David McConnehey. Here is a little highlight video from this past weekend’s Smallville Comic Con in Kansas. We made it! Thank you to everyone who contributed to our Kickstarter! Much appreciated! 2 weeks left. We still have a ways to go! Please consider pledging! OK! Here we Go! 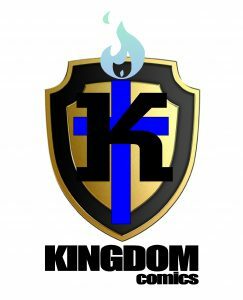 A major breakthrough has occurred for Kingdom Comics! We have distribution! Our comic books will be in bookstores across the country-including Barnes and Noble-starting in July. In the mean time, we need help covering some of the overhead until we (ahem) get paid. So we’ve put together a Kickstarter Fundraiser. Please check it out. Any and all assistance counts😁. Kingdom Comics Presents #7 is now available! Check out video below, then follow link for free download!